Gating, Regulation, and Structure in K2P K+ Channels: In Varietate Concordia? K2P K+ channels with two pore domains in tandem associate as dimers to produce so-called background conductances that are regulated by a variety of stimuli. Whereas gating in K2P channels has been poorly understood, recent developments have provided important clues regarding the gating mechanism for this family of proteins. Two modes of gating present in other K+ channels have been considered. The first is the so-called activation gating that occurs by bundle crossing and the splaying apart of pore-lining helices commanding ion passage. The second mode involves a change in conformation at the selectivity filter (SF), which impedes ion flow at this narrow portion of the conduction pathway and accounts for extracellular pH modulation of several K2P channels. Although some evidence supports the existence of an activation gate in K2P channels, recent results suggest that perhaps all stimuli, even those sensed at a distant location in the protein, are also mediated by SF gating. Recently resolved crystal structures of K2P channels in conductive and nonconductive conformations revealed that the nonconductive state is reached by blockade by a lipid acyl chain that gains access to the channel cavity through intramembrane fenestrations. 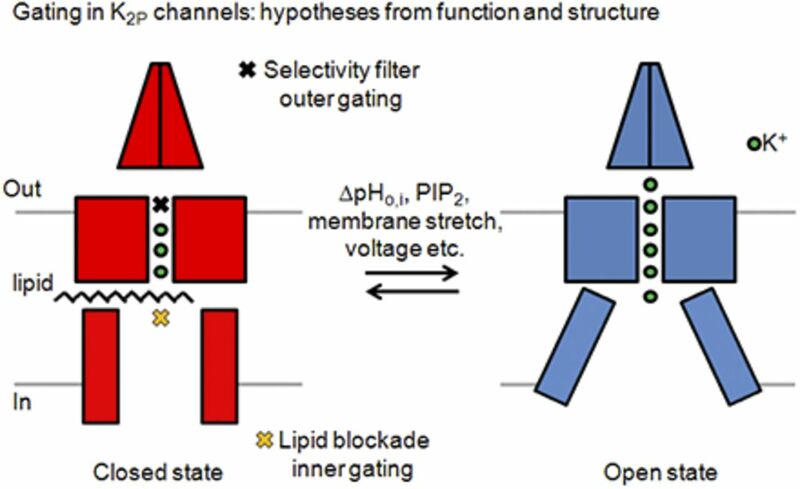 Here we discuss whether this novel type of gating, proposed so far only for membrane tension gating, might mediate gating in response to other stimuli or whether SF gating is the only type of opening/closing mechanism present in K2P channels. K+ channels, plasma membrane proteins that mediate movement of potassium ions into and from cells, are crucial players in the function of virtually every eukaryotic excitable and nonexcitable cell. Structural and functional criteria have led to the classification of three major families: voltage-gated (KV), inwardly rectifying (Kir), and the two-pore domain (K2P) K+ channels. Members of the K2P family are responsible for the background conductance essential for the maintenance of the interior negative membrane potential of all cells. These K, conductances, already known to Hodgkin and Huxley, were thought to represent ion flow through rather inert, yet selective, holes of little physiologic importance and often were regarded as a nuisance in the study of meaningful conductances and corrected for by subtraction. This situation changed drastically, however, with the identification of K2P channels as molecular counterparts of the elusive K+ leak pathway. Additionally, increasing evidence suggested that a variety of stimuli, including changes in membrane tension, voltage, temperature, extracellular and intracellular pH, phospholipids, and other signaling molecules arising from G-protein–coupled receptor activation could fine-tune the activity of these ion channels. Voltage-gated KV channels and inwardly rectifying Kir channels assemble as tetramers, and each subunit makes a symmetrical contribution to the K+ ion permeation pathway through so-called P-domains, short segments of the protein central to ion selectivity. Although each monomer possesses a single copy of the pore domain, K2P channels have two pore domains (P1 and P2) in tandem per subunit and four transmembrane domains (TM1–TM4). K2P channels will form homodimers, and sometimes heterodimers, where each monomer contributes two P-domains to form a pseudotetrameric selectivity filter (SF) with transmembrane domains TM2 and TM4 lining the inner conduction pore. The K2P channel family, which has been extensively reviewed (Enyedi and Czirják, 2010; Lesage and Barhanin, 2011; Feliciangeli et al., 2015; Renigunta et al., 2015; Sepúlveda et al., 2015), is composed of the products of 15 mammalian genes further classified into six subfamilies: TWIK (weak inward rectifiers), TREK (lipid and mechanosensitive channels), TASK (acidification-inhibited), TALK (alkalinization-activated), THIK (inhibited by halothane), and TRESK (spinal cord channels). The gating mechanism of K2P channels (i.e., the process through which the channels move between open and closed states) is far from completely understood, but exciting advances are starting to provide important hypotheses on this central ion channel protein property. In KV and Kir K+ channels, it is well established that gating occurs mainly through three types of mechanisms. The first mechanism of gating to consider takes place in response to changes in membrane potential and involves a conformational change of the activation gate, which can also respond to a variety of other signaling cues. A physical picture of the activation gate operation arose from the comparison of X-ray diffraction structures of prokaryotic K+ channels KcsA and MthK (Doyle et al., 1998; Jiang et al., 2002a,b). In the KcsA channel, helices lining the inner conduction pathway bundle together at the intracellular end in such a way that they obstruct free ion passage, but in MthK channels, the helices are splayed apart to afford ample space for ion transit. The open conformation observed in MthK channels occurs through a bending of the inner helices at a glycine residue, a gating hinge that is highly conserved throughout the K+ channel superfamily. 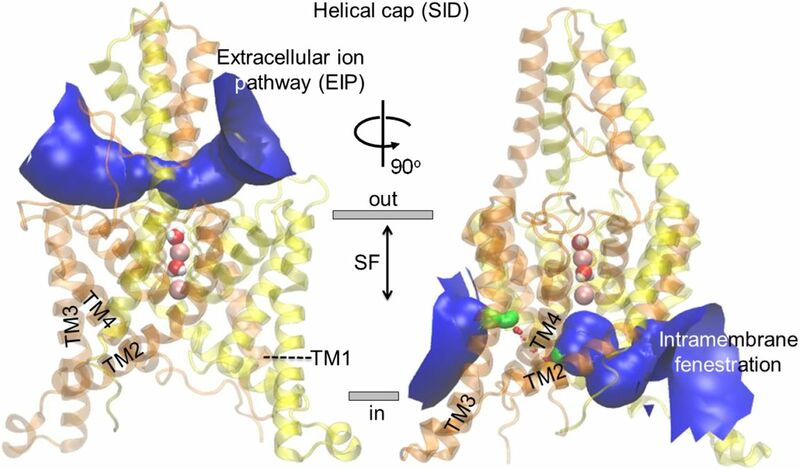 A second widely accepted mechanism of gating, termed C-type inactivation, occurs at the SF (Hoshi et al., 1991); the SF changes its conformation losing some of its coordinated K+ ions and in doing so prevents ion passage, sometimes even losing selectivity. Evidence for involvement of the SF in C-type inactivation is provided by its dependence on extracellular K+ or other permeant cations, on the action of pore inhibitor tetraethylammonium (TEA) or its sensitivity to mutations of residues in the SF vicinity (Choi et al., 1991; López-Barneo et al., 1993; Levy and Deutsch, 1996; Kiss et al., 1999). As reported in Shaker channels and in line with this effect at the SF, during the inactivation process the channel can become selective to Na+ over K+ (Starkus et al., 1997; Kiss et al., 1999). C-type inactivation has been observed on prolonged depolarization-promoted opening of KV channels (Kurata and Fedida, 2006) and in other channel types. For example, the KcsA channel is opened by a decrease in intracellular pH, which elicits the opening of the activation bundle-crossing gate (Cuello et al., 1998; Perozo et al., 1999), followed by inactivation where the current decreases (Gao et al., 2005). Structural work on the KcsA channel (Zhou et al., 2001; Zhou and MacKinnon, 2003) shows that upon K+ removal, the channel undergoes a conformational change when moving from a conductive state to a nonconductive state owing to a reduction in the number of bound ions at the SF, a situation that might correspond to a C-inactivated channel. More recently, further structural studies of the KcsA channel showed that higher degrees of opening at the bundle crossing correlated with lower occupancy of the SF by permeant ions and presumably lower capacity to conduct (Cuello et al., 2010). Research is still required to determine whether these two types of gating mechanisms are present in K2P channels and, if so, how they are functionally coupled. A third mode of gating, N-type or ball-and-chain inactivation, reflects block of the open pore by a portion of the amino terminal of the same protein (Hoshi et al., 1990). This type of gating has not been observed in K2P channels. One of the most exciting developments in the field of K2P channel biology was the publication of the first X-ray structures of K2P channels TRAAK and TWIK-1 (Brohawn et al., 2012; Miller and Long, 2012), followed later by TREK-2 (Dong et al., 2015) and the still unpublished but released TREK-1 (Protein Data Bank, www.pdb.org, PDB ID code 4TWK). The structures are quite similar but for small differences, suggesting that they can serve as a general blueprint for modeling other unexplored K2P channels. The main features of a TRAAK structure (PDB ID code 4I9W) are shown in Fig. 1. The channels assemble as dimers and exhibit a selectivity filter with the predicted quasi-4-fold symmetry where K+ ions are coordinated as previously described for tetrameric K+ channels. The inner pore-lining helices TM2 and TM4 take an oblique stance across the membrane while TM1 and TM3 run roughly vertically. 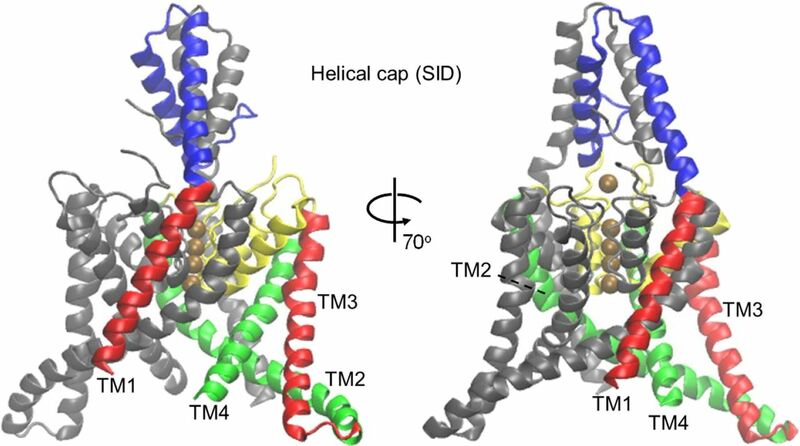 The conformation of the inner helices suggests that the activation gate, if operative, is in a wide-open state with glycine residues that correspond to the gating hinges in tetrameric channels conserved in the K2P family proteins. General features of K2P channels illustrated in the TRAAK structure (PDB ID: 4I9W) shown in cartoon representation. One subunit is colored gray, and the other is represented with TM1 and TM3 in red; cap in blue; TM2 and TM4 in green; and P1 and P2 in yellow. K+ ions are shown in Van der Waals representation. Image created with visual molecular dynamics (VMD) (Humphrey et al., 1996). A distinguishing feature of K2P structures is a remarkable cap assembly formed by two large extracellular linkers from the TM1 to the pore loop P1. This helical cap had been identified as the self-interacting domain and is stabilized by an apical disulphide bridge that although not strictly conserved, appears to be important in some (Lesage et al., 1996b), but not all, K2P channels (Niemeyer et al., 2003; Goldstein et al., 2016). TM1 and the cap form a long single helix in TWIK-1, whereas they are connected by a short loop in TRAAK. In both structures, the presence of the cap prevents direct ion transit between the pore mouth and the extracellular milieu, which is afforded by lateral tunnel-like entrances of molecular dimensions, referred to as extracellular ion pathways. The presence of the cap explains K2P channel refractoriness to inorganic and toxin pore blockers (Lesage et al., 1996a; Fink et al., 1998). All known K2P channel structures also have unusual prominent openings providing connections between the lipidic membrane core and the central cavity that is the intracellular part of the ion conduction path. As we discuss later herein, these intramembrane fenestrations might play a crucial role in the gating of K2P channels. Both the extracellular ion pathways and intramembrane fenestrations are more clearly shown in a model of TASK-2 (Fig. 3) based on the same TRAAK structure illustrated in Fig. 1. Interestingly, subsequent to the first publication of the TRAAK structure (Brohawn et al., 2012), a second, higher-resolution TRAAK structure by the same authors (Brohawn et al., 2013) revealed a domain-swapped chain connectivity that exchanged outer helices 180 degrees around the channel. This meant that the transmembrane domain 1 of subunit A outer helix lies next to TM2B inner helix rather than the expected helix of the same subunit [see a clear cartoon of this arrangements in Fig. 4 of the review by Renigunta, Schlichthorl, and Daut (Renigunta et al., 2015)]. In addition, this structure, on which the TASK-2 model in Fig. 3 is based, revealed that one of the intramembrane fenestrations is closed through an inner helix conformational change (Brohawn et al., 2013). Drosophila KCNK0 channels are regulated by protein kinase C, A, and G phosphorylation (Zilberberg et al., 2000), and this regulation arises from gating at the SF. The inhibition of KCNK0 in an activation-dependent manner by extracellular Zn2+ suggests that this gating resembles C-type inactivation. More evidence for the role of the SF involves the requirement of a histidine residue in P1, the effects of extracellular K+ and TEA, and the effect of residue mutagenesis near the SF (Zilberberg et al., 2001). Additionally, evidence for an important role of the SF in the gating of mammalian K2P channels has come from the investigation of the effect of extracellular pH (pHo) on several members of this family. TASK-1 and -3 are closed by extracellular H+ sensed through a histidine residue at the extracellular entrance of the SF (Kim et al., 2000; Rajan et al., 2000; Lopes et al., 2001) at a position occupied by a negatively charged glutamic acid in most K+ channels. This position suggests that the protonation state of the sensing histidine has an effect on SF occupancy, and this could lead to acidification-promoted closing akin to C-type inactivation. As expected for an effect at the SF, extracellular K+ counteracts the effect of acidification on the activity of TASK-1 (Lopes et al., 2000, 2001) and TASK-3 (González et al., 2013), and site-directed mutagenesis affecting ion selectivity brings about modifications in pHo gating (Yuill et al., 2007). Clarke et al. (2008) demonstrated the importance of the TM1-P1 loop in pHo dependence and Zn2+ blockade of TASK-3. The effect of pHo on TASK-3 gating is cooperative and occurs with a Hill number (n) of 2 (Kim et al., 2000), but in TASK-1, cooperativity is only present at high extracellular K+ (Lopes et al., 2001; González et al., 2013). The permeant ion effect is enhanced by the electrostatic effect of TASK-3 Glu70 (González et al., 2013), a glutamate residue at the inner wall of TASK-3 extracellular ion pathways that lies close to the histidine sensors (Clarke et al., 2008). Glu70 affects the electrostatic potential in the extracellular ion pathway and might alter the occupancy of the outermost SF K+ binding sites (González et al., 2013). The importance of electrostatics in the extracellular ion pathways is also highlighted by the effect of TASK-3 blockers Zn2+ and ruthenium red, which requires the presence of the Glu70 residue (Czirják and Enyedi, 2003; Clarke et al., 2004, 2008; Musset et al., 2006) and a neutral His98 (Clarke et al., 2004, 2008). Additionally, TASK-3 blockade by Zn2+ and ruthenium red is cooperative and strongly impeded by increasing concentrations of extracellular K+ (González et al., 2013). Ruthenium red inhibition of TREK-2, the only other K2P channel sensitive to this inhibitor, also crucially depends on an aspartate residue (Asp135) lining the inner wall of the extracellular ion pathway (Braun et al., 2015). Extracellular acidification turns TWIK-1 channels from K+-selective to monovalent cation-permeable channels (Chatelain et al., 2012; Ma et al., 2012). Histidine 122 is the H+ sensor in TWIK-1, but other unidentified sites also contribute to modulation by acidification. This change in selectivity observed in TWIK-1 upon acidification is also encountered in experiments where the pHo sensor of TASK-2 is transferred to a TASK-3 channel lacking the sensing histidine (Zúñiga et al., 2011). Extracellular acidification within the same pH range inhibits TREK-1 but activates TREK-2. Although the proton sensor in TREK-1 and -2, His126, and His151, respectively, is located in the TM1-P1 loop preceding the P1 domain, the contrasting channel responses to extracellular acidification have to do with differences in the P2-TM4 extracellular loop; the loop determines attraction or repulsion between the proton-sensing histidines and closely located negatively or positively charged residues. The effects of extracellular K+ on the pHo dependence of these channels suggest that these residues affect the SF gate (Cohen et al., 2008; Sandoz et al., 2009). Is There the Equivalent of an Activation Gate Operative in K2P Channels? As discussed already, gating of K2P channels by changes in extracellular pH shares many characteristics with the so-called C-type inactivation in KV and Kir channels. The gating processes responsible for the modulation of K2P channels by other stimuli, including phospholipid signaling, G-protein–coupled receptor stimulation, and changes in membrane tension or intracellular pH are less well characterized. Gating in response to voltage does occur in K2P channels, although it has been largely ignored and remained poorly understood (Renigunta et al., 2015); however, recent detailed work (Schewe et al., 2016) provides a robust hypothesis of how the voltage-dependence of K2P channels might work in the absence of a conventional voltage-sensor. It was shown that voltage dependence was present in most K2P channels, except for TWIK-1, and relies crucially on the movement of the permeant ion and therefore on its electrochemical potential difference. The voltage-dependence results are consistent with the movement of three to four ions across the membrane voltage drop that is thought to be concentrated along the SF. This hypothesis proposes an empty, inactive SF at negative potentials. Depolarization would push ions into the SF, which when fully occupied would become permeant to allow for the outward movement of K+. High occupancy would not be reached by forcing ion movement in the inward direction; under these conditions, the SF would become inactive. Interestingly, physiologic activation by lipids, membrane tension, and intracellular acidification can suppress voltage-dependence and switch the channels to a leak mode. To what extent and for which K2P channels the voltage dependence plays a physiologic role is not known, particularly since voltage-dependence appears to be rather unimportant in channels activated by other pathways. The model presented by Schewe et al. (2016) will prompt further work to explore this point, perhaps using channels in their native environment. Ashmole et al. (2009) hypothesized the existence of an inner helices bundle crossing activation gate to explain voltage gating of TASK-3). The effect of voltage is quite weak, and the measured gating charge is 0.17, which is small compared with ∼2 for the ensemble of K2P channels studied by Schewe et al. (2016). Nevertheless, this can be enhanced by mutations affecting pore lining in helices TM2 and TM4 and virtually abolished by mutating the putative glycine hinge residues to alanine residues. These maneuvers did not affect gating by extracellular pH, thus arguing for the existence of separate activation and SF gates. Further support for the potential existence of an internal gate was provided by the work of Ben-Abu et al. using a chimaera created by replacing the TM5-P-TM6 region of Shaker KV with the TM1-P1-TM2 transmembrane part of the Drosophila K2P channel KCNK0 (Ben-Abu et al., 2009). This chimeric construct could be activated by voltage, presumably when the Shaker voltage-sensor activated the KCNK0 activation gate. Although this demonstrates the potential function of a bundle crossing mechanism using a K2P channel pore, it must be noted that the tetrameric structure of the chimaera might have freed KCNK0 TM2 to move in a way that was not possible in the dimeric arrangement of the native channels. An interesting result arising from these experiments is the observation that if an internal gate were present in the K2P channels, its opening might be coupled to SF opening rather than the reciprocal action that has been observed in KV channels. Further evidence suggesting that there might be a gating mechanism separate from the mechanism taking place at the SF has emerged from time to time, but research has fallen short of identifying the location or nature of such a process. TWIK-1 appears to play an important physiologic role, but its detailed study has been plagued by controversy [reviewed by (Sepúlveda et al., 2015)]. The study of TWIK-1 gating is made difficult by its low plasma membrane expression in heterologous systems, and even after enhancing membrane expression by mutational strategies, TWIK-1 channel activity remains low. Inspired by experiments demonstrating a sensitivity of KCNK0 activity on the hydrophobicity of certain residues in one of the inner helices (Ben-Abu et al., 2009), Chatelain et al. (2012) identified mutation L146D in TM2 as a mutation that could induce a large increase of TWIK-1 activity. A homologous mutation in THIK-2, I158D, has a similar effect on this low activity K2P channel (Chatelain et al., 2013). Molecular dynamics and experimental analysis of TWIK-1 provided a possible explanation for the effect of the mutation (Aryal et al., 2014); molecular dynamics studies by Aryal and colleagues revealed that a region of the inner pore of the channel located 5–10 Å below the SF presents a constriction that gets dewetted during simulations. This finding suggests that the region represents an energy barrier to ion passage even in the absence of complete physical occlusion of the pore. The hydrophobic constriction occurs in a location where residues Leu146 of TM2 and Leu261 of TM4 project their side chains into the pore. Experimental analysis of various hydrophilic and hydrophobic replacements of these residues confirms that they are responsible for the low activity of TWIK-1 and led to the hypothesis that this phenomenon may be part of a hydrophobic gating mechanism (Aryal et al., 2015) regulating TWIK-1 activity. Physical or chemical inputs that have an effect on this postulated mode of gating of TWIK-1 have yet to be identified, but movement of the helices on which the leucines responsible for the constriction reside might be involved in a possible physiologic channel opening. Directly examining the state of a putative intracellular gate in K2P channels with the methods pioneered by Armstrong (1971) using quaternary ammonium ions had not been performed as it was believed that these channels were resistant to the blockers. This notion was dispelled by an elegant series of experiments performed by Piechotta and colleagues that demonstrated that hydrophobic quaternary ammonium ions are good TRESK, TREK-1, and TASK-3 blockers when applied from the intracellular aspect of membranes (Piechotta et al., 2011). Using these type of assays, they demonstrated that tetrapentyl- or tetrahexylammonium bind deeply within the TREK-1 pore with high-affinity, irrespective of whether the channel is in a closed state or stimulated to open by intracellular acidification or membrane tension. It follows that the gating in response to these stimuli does not occur at a classic inner gate and that the bundle crossing must be permanently in the open state. Identification of the quaternary ammonium ion binding site suggests that the gating occurs at a location above the central cavity most probably at the SF, and this would become a hub where all forms of gating would converge. A similar conclusion was reached by Bagriantsev and colleagues also using TREK-1 but with a different approach. Gain-of-function mutations of residues near the SF impacted SF gating commanded by extracellular pH, temperature, and membrane tension, stimuli that were expected to exert their effect at a separate, inner gate (Bagriantsev et al., 2011). Indeed, besides the histidine pHo sensor, all other sensing elements of TREK-1, including those for arachidonic acid, membrane stretch, and phosphorylation, are found at the intracellular C terminus [reviewed by Honoré (2007), Dedman et al. (2009), and Noel et al. (2011)]. For example, internal acidification converts low-activity TREK-1 into a high-activity channel through neutralization of C-terminal glutamate pHi sensor E306; a cluster of positively charged residues configures a phospholipid-sensing domain, allowing for C terminus/membrane interaction essential to open TREK-1 channels; phosphorylation of C-terminal serine residues also impacts TREK-1 gating. These sensors can be partially disengaged from the gating machinery by weakening the connection between the C terminus and TM4. This is accomplished by introducing a treble glycine or alanine replacement at the end of TM4, mutations that presumably impair the C terminus-TM4-SF coupling (Bagriantsev et al., 2012). The idea for C terminus and SF coupling was already present in the work of Zilberberg et al. (2000, 2001), which showed that C terminus phosphorylation affected C-type inactivation gating in KCNK0 channel. Recent work by Zhuo et al. (2016) has addressed the gating mechanism for activation of TREK-2 by 2-aminoethoxydiphenyl borate (2-APB). The 2-APB site of action is a proximal portion of the C terminus (pCt) that, when deleted, as in mutant ΔpCt, leads to a loss of 2-APB–induced activity. Using an additional TM2 “hinge” G312A mutant, they showed that the effect of 2-APB requires hinge operation. 2-APB action at the C terminus appears linked to a remote change in SF activation state given that both ΔpCt and G312A mutants have decreased sensitivity to pHo gating that is known to be exerted at the filter (Sandoz et al., 2009). Perhaps surprisingly, 2-APB effects were not dependent on extracellular K+ concentration. Zhuo et al. (2016) interpreted their results in terms of an allosteric coupling of stimuli sensed at intracellular portions of the channel structure and gating at the SF, which supports the hypothesis of SF activation or inactivation as the sole mode of K2P channel gating. Despite recent evidence for a central role of the SF in all forms of K2P channels gating, some experimental results are difficult to reconcile with this concept. For example, Sandoz et al. (2009) have provided evidence for separate gates responding to intracellular pH or A-kinase anchoring protein (AKAP150) and extracellular pH. The mutant TREK-1-E306A channel is insensitive to pHi, becomes constitutively open, and cannot be further activated either by mechanical stimulus or polyunsaturated fatty acids, but it does conserve its pHo dependence. Binding of AKAP150 to the C terminus of TREK-1 has a similar effect as the E306A mutation, so that the TREK1/AKAP150 complex also becomes constitutively active. AKAP150 binding, however, fails to alter the extracellular pH sensitivity of the channel. Perhaps also suggestive of separate gates, extracellular K+ concentration, which has a marked effect in the pHo-gating of TREK-1 (Cohen et al., 2008), has no effect on TREK-1 gating mediated by intracellular pH (Piechotta et al., 2011). Puzzlingly, however, TREK-1 gating induced by intracellular pH was sensitive to the intracellular ion. New and exciting ideas regarding the mechanosensitive gating of K2P channels that may apply to other forms of gating have recently emerged from X-ray structures of several crystallized channels. A rather unique feature of K2P channels is the presence of wide pathways or fenestrations connecting the inner pore with the upper membrane leaflet (Brohawn et al., 2012; Miller and Long, 2012) and in TWIK-1 evidence suggests that these fenestrations are occupied by lipid acyl chains projecting into the ion conducting pore (Miller and Long, 2012). In a high-resolution structure of TRAAK, which is represented in the Fig. 1, one of the fenestrations is pinched closed by a movement of one of the inner helices (Brohawn et al., 2013), revealing that these side openings into the membrane are gated. Further study of the TRAAK structure (Brohawn et al., 2014) revealed differences in the conformation of each subunit’s TM4 helix. One TM4 is in an “up” conformation in which the helix is bent around the highly conserved hinge glycine located roughly at the membrane center. The TM4 of one subunit is apposed to the TM2 of the other subunit through an array of hydrophobic side chains and, in doing so, effectively seals the fenestration on that side of the structure. At the opposite side of the channel, the other TM4 spans the membrane with no kink at the hinge glycine; in this “down” conformation, the wide-side fenestration remains open, and an acyl chain that corresponds to a copurified lipid protrudes from the fenestration into the central cavity below the SF (Fig. 2A). In this structure, five ions, four in the SF and one above the SF, were observed in the conduction pathway (Fig. 2B). Crystallization in the presence of a TRAAK activator revealed that both TM4 helices resided in the up position. Both fenestrations were closed (Fig. 2C) and lacked a lipid intruding into the inner cavity; instead, a sixth ion appeared at the site previously occluded by the lipid chain (Fig. 2D). Brohawn et al. (2014) concluded that the up conformation corresponded to the conductive, open state of the channel, and the down state, with a lipid blocking the conduction pathway, corresponded to the closed state of the channel. 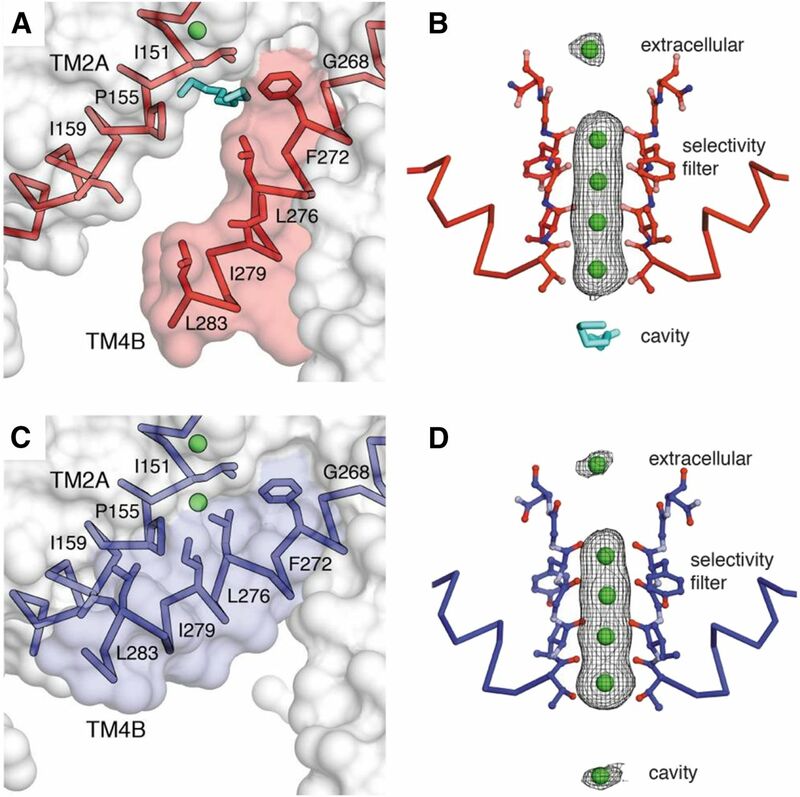 Movements of transmembrane domains TM4 and TM2 leading to gating changes in TRAAK channel. Membrane view of the cytoplasmic half of TM4B in the down configuration (A) with an acyl chain (cyan) penetrating in the cavity left between TM4B and TM2A. (B) The state of the SF with five ions (green spheres) in the conduction pathway with the site right below the SF occupied by the acyl chain. (C and D) A conductive TRAAK structure in the same views as (A and B). The TM4 helix now apposes TM2, thus closing the fenestration; the acyl chain is absent, and its place below the SF is taken by a sixth ion, revealing an unimpeded conductive pathway. Reprinted from Nature by permission from Macmillan Publishers Ltd (Brohawn et al., 2014). Two other papers have addressed the structural basis of gating in TREK-2 (Dong et al., 2015) and TRAAK (Lolicato et al., 2014). In both studies, the up and down conformations of TM4 determined whether the structure possessed closed or open side fenestrations, respectively, and TREK-2 structural information is consistent with a model in which the down conformation corresponds to the closed state (Dong et al., 2015). As described by Brohawn et al. (2014) for TRAAK, TREK-2 channels captured in the down conformation possess lipid chains, located directly below the SF, which may obstruct ion conduction (Dong et al., 2015). These lipids are absent from the up conformation and from channels blocked by fluoxetine occupying the central cavity entrance. TREK-2 SF ion occupancy decreases from four to three when moving from the up to the down conformation, suggesting that gating may occur at the SF. No evidence for differences in the SF or the pore helices between these putative activation states has been found, however. In the TRAAK study (Lolicato et al., 2014), gain-of-function mutant channel structures that had previously been functionally characterized (Bagriantsev et al., 2012) were used to probe the C terminus-TM4-SF coupling hypothesis of gating. In contrast to what has been described here, the structures revealed a situation in which the down conformation was conductive, and the up conformation corresponded to the closed channel; this discordant finding of Lolicato et al. (2014) remains unexplained. Functional evidence strongly supports the model introduced by Brohawn et al. (2014) that hypothesized a second, inner gate in K2P channels operated by lipid blockade gating commanded by the opening of the intramembrane fenestrations. Assays of TRAAK revealed that tethering TM4 and TM2 via a disulphide bond to trap the “up” conformation led to reduction-reversible channel activation. Reconstitution of TRAAK in lipids with branched, thicker acyl chains unable to squeeze through the side fenestrations yielded channels with higher activity (Brohawn et al., 2014). It is also significant that crystallization of TRAAK in the presence of the channel activator trichloroethanol captures the up state, (Brohawn et al., 2014), whereas TREK-2 in the presence of the inhibitor fluoxetine captures the down state (Dong et al., 2015). The lipid-blockade gating hypothesis of Brohawn et al. (2014) is difficult to reconcile with the results of Piechotta et al. (2011) that show a permanently open intracellular gate in some K2P channels, but one possible explanation could be that under their experimental conditions, the permeation pathway is always free of lipid. Alternatively, the lipid barrier might not be a hindrance to the passage of the rather hydrophobic quaternary ammonium compounds used by Piechotta and colleagues, but neither of these speculations has been investigated directly. TASK-2 is a K2P channel that plays important physiologic roles (López-Cayuqueo et al., 2015), including cell volume regulation (Niemeyer et al., 2001; Barriere et al., 2003), renal bicarbonate reabsorption in the proximal tubules of the kidney (Warth et al., 2004), the central detection of CO2 and O2 by chemosensitive neurons implicated in breathing control (Gestreau et al., 2010; Wang et al., 2013), and in the hearing function through an essential role in cochlear outer sulcus cells possibly in K+ recycling (Cazals et al., 2015). Certain patients with a predisposition to Balkan endemic nephropathy carry the T108P mutation in TASK-2 (Toncheva et al., 2014); TASK-2 mutant T108P does not generate any significant currents in heterologous expression experiments, and this lack of activity is consistent with a role in Balkan endemic nephropathy (Veale and Mathie, 2016). TASK-2 is an exception among K2P channels gated by extracellular pH in that the channel is inhibited by acidification and activated by alkalinisation (pK1/2 ∼8), but it lacks the conserved histidine sensor described above (Reyes et al., 1998; Niemeyer et al., 2007). Instead, opening of TASK-2 owing to increases in extracellular pH requires the neutralization of arginine 224 near the second pore domain (Niemeyer et al., 2007), and a protonation/deprotonation cycle of pHo-sensing R224 side chain gates the TASK-2 channel by electrostatically tuning the conformational stability of its SF (Niemeyer et al., 2007; Zúñiga et al., 2011). Depolarization and increasing extracellular K+ concentration decrease the pK1/2 for pHo gating of TASK-2 (Reyes et al., 1998; Niemeyer et al., 2010). These effects occur due to augmented K+ ion occupancy of SF or extracellular ion pathways electrostatically favoring the deprotonation of charged R224 sensing residues (Niemeyer et al., 2010; Cid et al., 2013). This type of mechanism might extend to same-clade members TALK-1 and -2 (Niemeyer et al., 2007). Inactivation at the SF is not thought to be the gating mechanism for the intracellular pH-induced activation of the TALK-subfamily K2P K+ channel TASK-2 (Niemeyer et al., 2010). pHo-insensitive TASK-2-R224A mutant is not altered in its pHi-dependence, suggesting that the pHi dependence of TASK-2 occurs independently of the SF-gating responsible for pHo dependence. Furthermore, pHi gating of TASK-2 is insensitive to voltage and extracellular K+, both strong modulators of gating by extracellular pH. Direct action of G protein βγ subunits that interact with lysine residues at the C-terminal domain also close TASK-2 (Añazco et al., 2013). Neutralization of these lysine residues renders the channel insensitive to Gβγ regulation but does not alter pHo gating. TASK-1 and TASK-3 are insensitive to intracellular pH, but are inhibited upon activation of G-protein–coupled receptors via a direct effect of diacylglycerol at a C-terminal domain (Wilke et al., 2014); however, the affected gating process is unknown. It is interesting to consider the model proposed by Brohawn at al. (2014) as a potential mechanism of action for various intracellular stimuli that gate K2P channels, including intracellular pH, phospholipids, C-terminal phosphorylation, and G-protein subunit interaction. It is easy to speculate that the conformational change gating the intramembrane fenestrations might occur subsequent to a C-terminal sensor–exerting force on TM4. It is known that TREK-1 activation is accompanied by association of the TREK-1 C terminus with the inner membrane leaflet, whereas dissociation occurs with inhibition (Sandoz et al., 2011); these conformations could relate to TM4 movement (Dong et al., 2015) and lead to closing and opening of the side fenestrations, respectively. We have modeled TASK-2 on the basis of a published TRAAK structure to help us consider possible application of the hypothesis proposed by Brohawn et al. (2014) in TASK-2 gating processes (Fig. 3). The illustration in Fig. 3 highlights the tunnel-like cavities connecting the SF to the extracellular medium (the extracellular ion pathway) and the intramembrane fenestrations, one of which is closed in this model based on a high resolution TRAAK structure (Brohawn et al., 2013). In TASK-2, the sensor for intracellular pH is lysine Lys245 (Niemeyer et al., 2010), which lies at the C-terminal end of TM4 (Fig. 4). It is tempting to conjecture that a neutral Lys245 would favor the hydrophobic interactions that close the TASK-2 intramembrane fenestrations leading to channel opening, but a charged residue would preclude the apposition of TM4 and TM2, gate the fenestration open, and thus close the channel. New experimental approaches will have to be used to explore the validity of these speculations. General features of K2P structure illustrated in a homology model of TASK-2. Molecular model for the TASK-2 molecule based on the X-ray–derived structure of TRAAK (PDB ID code 4I9W). Shown is a ribbon representation with K+ ions and H2O molecules in the SF. The extracellular ion pathway is drawn as a solid tunnel connecting the extracellular space and the entrance of the SF, and the transmembrane domains of one of the subunits (orange) are identified. The limits of the membrane are approximately indicated by the gray bars. On the right of the figure, the same structure turned 90 degrees around the main axis is shown to visualize intramembrane fenestrations, with only the one on the right open. HOLE color code is used: blue, radius > 1.15 Å; green, radius 0.6–1.15 Å; red, radius < 0.6 Å. Image created with visual molecular dynamics (VMD). Modeling the possible gating of the intramembrane fenestrations of TASK-2 by intracellular pH. The structures in red and blue are based on those of TRAAK shown in Fig. 2A and C, respectively, and imagine the possible structural effect of neutralizing TASK-2 pHi sensor (K245+ to K245 degrees) on the gating of the fenestrations leading to opening of the channel by alkalinisation. Figure created with visual molecular dynamics (VMD). In summary, K2P channels are far from being inert K+-selective holes that set the membrane potential in a passive way; these channels are exquisitely regulated by a wide variety of chemical and physical signals. Emerging details of the acute regulatory inputs that control K2P reveal many direct effects on the selectivity filter that are similar to classic C-type inactivation in more extensively studied KV and Kir channels. An array of other stimuli are sensed at the C-terminal end, and opinions have varied as to whether these effects are exerted at an inner gate involving the equivalent of an activation or bundle crossing gate in other K+ channel families or via an effect at the selectivity filter transmitted in a remote manner through transmembrane and pore helices. New evidence points to the possibility that a second gate opening and closing K2P channels could be related to lipid blockade commanded by the opening and closing of intramembrane fenestrations. This new hypothesis is very attractive, perhaps because it is new, but also because it is of high explanatory power. It is, however, an early model, and the jury is still out about which model could provide an integrated view of K2P channel gating. The question mark after the Latin motto of the title of this manuscript remains therefore firmly in place for the time being. ASPET thanks Dr. Katie Strong for copyediting of this article. Wrote or contributed to the writing of the manuscript: Niemeyer, Cid, González, Sepúlveda. The work in the authors’ laboratories is funded by FONDECYT grants 1140153 (M.I.N., L.P.C. and F.V.S.) and 1140624 (W.G.). The Centro de Estudios Científicos (CECs) is supported by the Centres of Excellence Base Financing Programme of Conicyt. (2013) G protein modulation of K2P potassium channel TASK-2 : a role of basic residues in the C terminus domain. Pflugers Arch 465:1715–1726. (1971) Interaction of tetraethylammonium ion derivatives with the potassium channels of giant axons. J Gen Physiol 58:413–437. (2014) A hydrophobic barrier deep within the inner pore of the TWIK-1 K2P potassium channel. Nat Commun 5:4377. (2015) Hydrophobic gating in ion channels. J Mol Biol 427:121–130. (2009) The response of the tandem pore potassium channel TASK-3 (K(2P)9.1) to voltage: gating at the cytoplasmic mouth. J Physiol 587:4769–4783. (2012) Metabolic and thermal stimuli control K(2P)2.1 (TREK-1) through modular sensory and gating domains. EMBO J 31:3297–3308. (2011) Multiple modalities converge on a common gate to control K2P channel function. EMBO J 30:3594–3606. (2003) Role of TASK2 potassium channels regarding volume regulation in primary cultures of mouse proximal tubules. J Gen Physiol 122:177–190. (2009) Inverse coupling in leak and voltage-activated K+ channel gates underlies distinct roles in electrical signaling. Nat Struct Mol Biol 16:71–79. (2015) Differential sensitivity of TREK-1, TREK-2 and TRAAK background potassium channels to the polycationic dye ruthenium red. Br J Pharmacol 172:1728–1738. (2013) Domain-swapped chain connectivity and gated membrane access in a Fab-mediated crystal of the human TRAAK K+ channel. Proc Natl Acad Sci USA 110:2129–2134. (2014) Physical mechanism for gating and mechanosensitivity of the human TRAAK K+ channel. Nature 516:126–130. (2012) Crystal structure of the human K2P TRAAK, a lipid- and mechano-sensitive K+ ion channel. Science 335:436–441. (2015) KCNK5 channels mostly expressed in cochlear outer sulcus cells are indispensable for hearing. Nat Commun 6:8780. (2012) TWIK1, a unique background channel with variable ion selectivity. Proc Natl Acad Sci USA 109:5499–5504. (2013) Silencing of the tandem pore domain halothane-inhibited K+ channel 2 (THIK2) relies on combined intracellular retention and low intrinsic activity at the plasma membrane. J Biol Chem 288:35081–35092. (1991) Tetraethylammonium blockade distinguishes two inactivation mechanisms in voltage-activated K+ channels. Proc Natl Acad Sci USA 88:5092–5095. (2013) TASK-2: a K2P K+ channel with complex regulation and diverse physiological functions. Front Physiol 4:198. (2004) Selective block of the human 2-P domain potassium channel, TASK-3, and the native leak potassium current, IKSO, by zinc. J Physiol 560:51–62. (2008) The M1P1 loop of TASK3 K2P channels apposes the selectivity filter and influences channel function. J Biol Chem 283:16985–16992. (2008) A novel mechanism for human K2P2.1 channel gating: facilitation of C-type gating by protonation of extracellular histidine residues. J Biol Chem 283:19448–19455. (2010) Structural mechanism of C-type inactivation in K+ channels. Nature 466:203–208. (1998) pH-dependent gating in the Streptomyces lividans K+ channel. Biochemistry 37:3229–3236. (2003) Ruthenium red inhibits TASK-3 potassium channel by interconnecting glutamate 70 of the two subunits. Mol Pharmacol 63:646–652. (2009) The mechano-gated K(2P) channel TREK-1. Eur Biophys J 38:293–303. 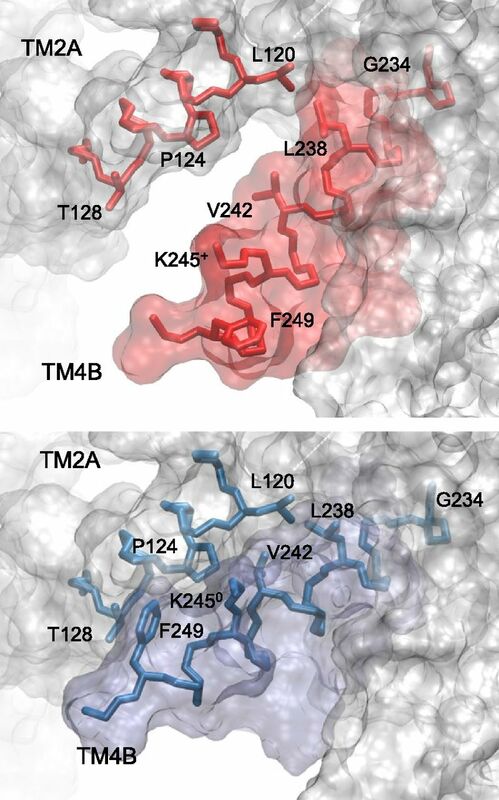 (2015) K2P channel gating mechanisms revealed by structures of TREK-2 and a complex with Prozac. Science 347:1256–1259. (2010) Molecular background of leak K+ currents: two-pore domain potassium channels. Physiol Rev 90:559–605. (2015) The family of K2P channels: salient structural and functional properties. J Physiol 593:2587–2603. (1998) A neuronal two P domain K+ channel stimulated by arachidonic acid and polyunsaturated fatty acids. EMBO J 17:3297–3308. (2005) Activation-coupled inactivation in the bacterial potassium channel KcsA. Proc Natl Acad Sci USA 102:17630–17635. (2010) Task2 potassium channels set central respiratory CO2 and O2 sensitivity. Proc Natl Acad Sci USA 107:2325–2330. (2016) Functional mutagenesis screens reveal the ‘cap structure’ formation in disulfide-bridge free TASK channels. Sci Rep 6:19492. (2013) An extracellular ion pathway plays a central role in the cooperative gating of a K(2P) K+ channel by extracellular pH. J Biol Chem 288:5984–5991. (2007) The neuronal background K2P channels: focus on TREK1. Nat Rev Neurosci 8:251–261. (1991) Two types of inactivation in Shaker K+ channels: effects of alterations in the carboxy-terminal region. Neuron 7:547–556. (1996) VMD: visual molecular dynamics. J Mol Graph 14:33–38, 27–28. (2002a) Crystal structure and mechanism of a calcium-gated potassium channel. Nature 417:515–522. (2002b) The open pore conformation of potassium channels. Nature 417:523–526. (2000) TASK-3, a new member of the tandem pore K+ channel family. J Biol Chem 275:9340–9347. (1999) Contribution of the selectivity filter to inactivation in potassium channels. Biophys J 76:253–263. (2006) A structural interpretation of voltage-gated potassium channel inactivation. Prog Biophys Mol Biol 92:185–208. (2011) Molecular physiology of pH-sensitive background K2P channels. Physiology (Bethesda) 26:424–437. (1996a) TWIK-1, a ubiquitous human weakly inward rectifying K+ channel with a novel structure. EMBO J 15:1004–1011. (1996b) Dimerization of TWIK-1 K+ channel subunits via a disulfide bridge. EMBO J 15:6400–6407. (1996) Recovery from C-type inactivation is modulated by extracellular potassium. Biophys J 70:798–805. (2014) Transmembrane helix straightening and buckling underlies activation of mechanosensitive and thermosensitive K2P channels. Neuron 84:1198–1212. (2000) Proton block and voltage gating are potassium-dependent in the cardiac leak channel Kcnk3. J Biol Chem 275:16969–16978. (2001) Block of Kcnk3 by protons: evidence that 2-P-domain potassium channel subunits function as homodimers. J Biol Chem 276:24449–24452. (1993) Effects of external cations and mutations in the pore region on C-type inactivation of Shaker potassium channels. Receptors Channels 1:61–71. (2015) TASK-2 K₂p K⁺ channel: thoughts about gating and its fitness to physiological function. Pflugers Arch 467:1043–1053. (2012) Acid-sensitive TWIK and TASK two-pore domain potassium channels change ion selectivity and become permeable to sodium in extracellular acidification. J Biol Chem 287:37145–37153. (2012) Crystal structure of the human two-pore domain potassium channel K2P1. Science 335:432–436. (2006) Effects of divalent cations and spermine on the K+ channel TASK-3 and on the outward current in thalamic neurons. J Physiol 572:639–657. (2001) Modulation of the two-pore domain acid-sensitive K+ channel TASK-2 (KCNK5) by changes in cell volume. J Biol Chem 276:43166–43174. (2010) Separate gating mechanisms mediate the regulation of K2P potassium channel TASK-2 by intra- and extracellular pH. J Biol Chem 285:16467–16475. (2003) Extracellular conserved cysteine forms an intersubunit disulphide bridge in the KCNK5 (TASK-2) K+ channel without having an essential effect upon activity. Mol Membr Biol 20:185–191. (2007) Neutralization of a single arginine residue gates open a two-pore domain, alkali-activated K+ channel. Proc Natl Acad Sci USA 104:666–671. (2011) Molecular regulations governing TREK and TRAAK channel functions. Channels (Austin) 5:402–409. (1999) Structural rearrangements underlying K+-channel activation gating. Science 285:73–78. (2011) The pore structure and gating mechanism of K2P channels. EMBO J 30:3607–3619. (2000) TASK-3, a novel tandem pore domain acid-sensitive K+ channel. An extracellular histiding as pH sensor. J Biol Chem 275:16650–16657. (2015) Much more than a leak: structure and function of K₂p-channels. Pflugers Arch 467:867–894. (1998) Cloning and expression of a novel pH-sensitive two pore domain K+ channel from human kidney. J Biol Chem 273:30863–30869. (2011) Optical probing of a dynamic membrane interaction that regulates the TREK1 channel. Proc Natl Acad Sci USA 108:2605–2610. (2009) Extracellular acidification exerts opposite actions on TREK1 and TREK2 potassium channels via a single conserved histidine residue. Proc Natl Acad Sci USA 106:14628–14633. (2016) A Non-canonical voltage-sensing mechanism controls gating in K2P K+ channels. Cell 164:937–949. (2015) Molecular aspects of structure, gating, and physiology of pH-sensitive background K2P and Kir K+-transport channels. Physiol Rev 95:179–217. (1997) Ion conduction through C-type inactivated Shaker channels. J Gen Physiol 110:539–550. (2014) NGS nominated CELA1, HSPG2, and KCNK5 as candidate genes for predisposition to Balkan endemic nephropathy. BioMed Res Int 2014:920723. (2016) Aristolochic acid, a plant extract used in the treatment of pain and linked to Balkan endemic nephropathy, is a regulator of K2P channels. Br J Pharmacol 173:1639–1652. (2013) TASK-2 channels contribute to pH sensitivity of retrotrapezoid nucleus chemoreceptor neurons. J Neurosci 33:16033–16044. (2004) Proximal renal tubular acidosis in TASK2 K+ channel-deficient mice reveals a mechanism for stabilizing bicarbonate transport. Proc Natl Acad Sci USA 101:8215–8220. (2014) Diacylglycerol mediates regulation of TASK potassium channels by Gq-coupled receptors. Nat Commun 5:5540. (2007) The selectivity, voltage-dependence and acid sensitivity of the tandem pore potassium channel TASK-1: contributions of the pore domains. Pflugers Arch 455:333–348. (2003) The occupancy of ions in the K+ selectivity filter: charge balance and coupling of ion binding to a protein conformational change underlie high conduction rates. J Mol Biol 333:965–975. (2001) Chemistry of ion coordination and hydration revealed by a K+ channel-Fab complex at 2.0 A resolution. Nature 414:43–48. (2016) Allosteric coupling between proximal C-terminus and selectivity filter is facilitated by the movement of transmembrane segment 4 in TREK-2 channel. Sci Rep 6:21248. (2001) KCNKØ: opening and closing the 2-P-domain potassium leak channel entails “C-type” gating of the outer pore. Neuron 32:635–648. (2000) Opening and closing of KCNKO potassium leak channels is tightly regulated. J Gen Physiol 116:721–734. (2011) Gating of a pH-sensitive K2P potassium channel by an electrostatic effect of basic sensor residues on the selectivity filter. PLoS One 6:e16141. You are going to email the following Gating, Regulation, and Structure in K2P K+ Channels: In Varietate Concordia?